Writing an effective press release and distributing it through the proper channels can increase brand visibility and create valuable connections. When your company catches the attention of a prominent reporter, influential blogger or social media giant, a simple announcement becomes an open door to bring in new customers. Increased exposure elevates your company above the competition and highlights it as an influential thought leader in the industry. However, none of this happens without effort on your part. 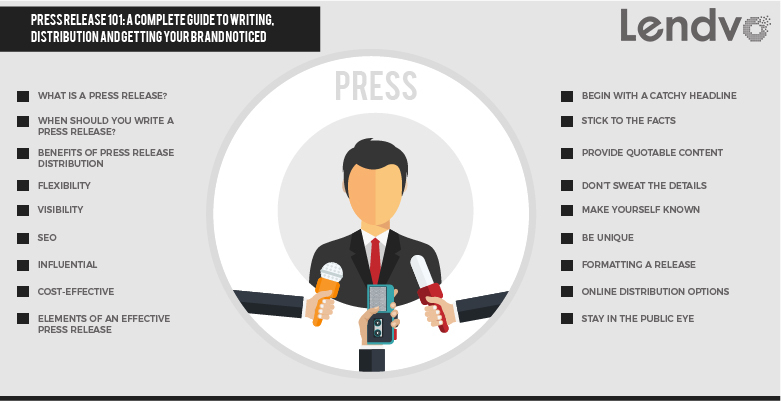 Understanding the press release process and leveraging it to your advantage takes time, and you have to be willing to put in the work to reap the benefits. Educate yourself about the process and learn what a good press release example looks like before adding this tactic to your content marketing strategy. Entrepreneur defines a press release as “a public relations announcement issued to the news media and other targeted publications for the purpose of letting the public know of company developments.” The Small Business Encyclopedia adds these “brief, printed statements” should “outline the major facts of a news story in journalistic style.” Rather than being full articles, releases serve as the basis for longer news stories. Issuing a press release is a way to communicate something newsworthy about your company to the public. In the past, this was done mostly by sending releases to mainstream media outlets. Today, however, the Internet provides many channels for distributing your announcements and spreading the word to a wider audience of potential customers. If your company is big enough to have a PR department handling its press releases, make sure all team members know which events are to receive coverage. Releases should be crafted to present information in the most straightforward and compelling way possible to make your event stand out to the media and your target audience. The public nature of the modern press release is what makes it so valuable to businesses. A well-written press release example has the potential to not only be distributed through traditional media but also go viral on social media. Rather than being simple announcements sent in the hopes of scaring up a little news coverage, press releases are now viable forms of content with the power to bring awareness of your business to a whole new audience. Any industry can use press releases to its advantage. Whether you deal in B2B or B2C marketing, online or physical sales, products, services or a very specific niche, you can benefit from writing a release and distributing it through all available channels. With the growth of content distribution and social media platforms, press releases now have the potential to be seen by just about any consumer in any target group. When an announcement goes out, it puts your brand in front of everyone from reporters hard at work to millennials browsing Facebook on their lunch breaks. Since there are always going to be more milestones for your company, it’s smart to plan one to two releases per month to encourage continued coverage. Research all potential distribution channels to increase the chances of reaching your ideal market. As with any form of content, press releases are prime places to include relevant keywords and links. Posting your release using online distribution outlets gives you the opportunity to build high-quality backlinks to your website. Search engines take this as a signal of authority, which in turn can improve rankings in organic search results. Keeping up a consistent schedule of announcements along with your regular content strategy helps elevate your company as an expert or influencer in the industry. Customers see your accomplishments and begin to associate your brand with growth and success. Social media expands this influence, so plan a corresponding social strategy for each successive release. Many free and low-cost press release distribution options are available for companies of all sizes. Each one delivers releases through different channels, but you always have a choice even if your marketing budget is small. Including links within your release drives more traffic to your site without the need for an additional marketing investment. Starting with a plan gives your release a purpose from the moment you sit down to write and prevents the copy from wandering off the topic or becoming bogged down with unnecessary details. Think about the story your release tells. What makes your product, event or accomplishment worthy of news coverage? How is what you offer different or better than what consumers can get from competitors? Media outlets receive stacks of press releases every day, and yours won’t be noticed if it isn’t extraordinary. Your release should make readers care about what you have to say and feel a strong enough connection with your company to make them want to know more. Although your press release isn’t a news article, it should still start like one. Using a hook with active words makes recipients curious enough to continue reading. Include a sub-headline with a little more information to draw them into the rest of the story. What is the press release about? Why is the subject of the release important? Where and when did the event happen, or is it happening in the future? Organize these facts into a concise first paragraph, delivering the information with as few words as possible. Follow the main facts of your press release with a quote from a prominent person within your company. News outlets often use quotes in their stories, so choose something memorable to grab readers’ attention and convey more about the importance of the information in the announcement. Adding a few more details after the quote fleshes out the press release, but don’t go overboard with what you include. Choose only relevant information relating directly to the subject of the release. If you have a lot to say, consider including links to outside resources for readers to follow if they want to learn more. This keeps the release short but doesn’t leave out anything you deem to be important. Remember to include your company’s boilerplate information in the final part of your announcement. A boilerplate is a short description of what your company is, what you do and what distinguishes you from others in the industry. To create a more personal connection, offer to provide relevant photos upon request. As you craft your release, focus on generating interest with quality content instead of using statistics to try and amaze readers. Numbers can be impressive, but they don’t communicate what makes your company interesting or distinctive. Show how you stand out from the crowd, whether it’s innovative product design, an unconventional social media strategy or being the first in the world to implement a new type of technology. Brevity is essential when bringing these elements together. Press release examples show short lines and paragraphs written without flowery language. Media outlets are busy with a multitude of news stories, and no one is going to sit around and read a press release the size of a novella. Focus on the facts, providing just enough information to get your point across. Write your whole release in the third person unless a direct quote includes first-person wording. Make all the copy professional, tight and vivid, avoiding passive words and phrases. This keeps the release on target and increases the likelihood of recipients engaging with the story and reading all the way to the end. To maximize the impact of the information, decide on a timeline for release. If the announcement is connected with a specific event, indicate media outlets shouldn’t run any stories until the day of the event gets closer. Label announcements “for immediate release” if you want them sent out to the public as quickly as possible. Proper formatting emphasizes the clear, concise message of your press release. Begin with the main contact person’s name and information so that there’s no confusion over who the recipient should get in touch with to discuss the story. Include both a phone number and an email address to make contact as convenient as possible. Place these details in the upper left corner. The date and release date for the announcement should appear in the upper right corner. This is where to note whether the information should be shared immediately or saved for a later time. Use bold type for the main headline, and emphasize the secondary headline with italics. Start the body of the release with the name of the city and the state where your company is located. This leads straight into your first paragraph, linking the information in the release to a specific area. Wrap up the release with your company’s boilerplate information, including a link back to your website. Indicate the end of the release with ENDS or the ### symbol. The entire release should be between one and two pages. If your copy goes to a second page, place the word “more” enclosed with hyphens at the bottom of the first page, and avoid splitting paragraphs between pages. Use proper punctuation throughout the release, avoiding exclamation points and other unnecessary emphasis. Don’t use capital letters in an attempt to draw attention to certain words; this makes your release appear unprofessional. After writing your release, read it over and check for mistakes. Have someone else in the company proofread the copy a second time to catch anything you might have missed and ensure no important information is left out. When you’re satisfied with the final product, it’s time to consider your distribution strategy. To get your press release to the right audience, you have to narrow down your choices and target the people who are already writing about subjects pertinent to your industry. Sending your release to the news room or to a media outlet’s general address for public inquiry almost guarantees it won’t be seen. Instead, look through staff directories to find reporters covering relevant beats. Make a list of all potential contacts, including their full names and email addresses, focusing on those who already connect with your target audience. Even if you’re sending a release to multiple staff members at the same media outlet, avoid sending one mass email to reach them all. Address individual messages directly to each reporter on your list. Using a formal greeting with the reporter’s name creates a personal connection right from the start, and you can adjust the content of the press release to be more appealing to individual niches. Place the press release headline in the subject line of your emails to make them stand out. When submitting to blogs, make sure your release contains relevant keywords and some kind of incentive for readers. Bloggers want something to drive traffic to their sites, and they’re more likely to post press releases written to help them toward this goal. Stick to bloggers in your industry, preferably those with a wide reach and a solid social media following. Finding the best influencers takes a little research, but the potential for wide coverage can pay off for your business. It’s best to begin by submitting your press release to reporters and bloggers you either know personally or whose work you’re familiar with. This ensures you pick the correct outlets and don’t waste time pitching your story to people who will never look at it. Existing contacts already know a bit about your business and your brand, and this should make them more willing to accept and publish your press release. The reach of these services varies from RSS news feeds to vast networks including websites, news media, content systems, journalists and more. Some services provide reports and analytics so that you can see how your release is performing and how many new audience members you’re engaging. In general, paid services provide more widespread distribution and can get your release in front of news outlets and websites with far-reaching influence. Once your release has gone out, don’t forget to share links on social media. Write unique content for each channel, and time updates to post at intervals to avoid flooding people who follow you on more than one platform. Schedule multiple updates over a period of time so that your message has more visibility on sites with a high volume of posts. Such wide distribution is another reason why it’s important for your press release to convey a story. Today’s releases count as content in the same way as blog posts, social media updates and email newsletters. Many people will read the release as it is, so it needs to be both a document journalists and bloggers can expand into an article and a story in and of itself. An accompanying blog post with more information about the information contained in the release can serve to flesh out the details for readers. To maximize the visibility of your press release, send it to your chosen blogs and media outlets shortly before you plan to release it through online distribution channels. This gives reporters and bloggers time to create a story and ensures your information is relevant and timely. Follow up with a phone call to make sure your release was received and provide more information if necessary. Schedule online distribution at a time when other businesses aren’t flooding the Internet with their press releases. Try a slightly “off” time at least a few minutes out from the hour, using what you know about the behavior of your target audience to pick a time when they’re most likely to be active. This prevents your release from being swamped by hundreds of others going out at the same time and increases the chances the right people will see it. Remember not to stop at one press release. Create a consistent schedule, issuing high-quality content on a routine basis. Use the same submission and promotion strategies for each release, and plan additional promotions for each announcement the media reports on. Continuing to spread the word about your company’s accomplishments keeps your brand in the public consciousness and has the potential to draw in new groups of customers through multiple channels. Writing and distributing a press release doesn’t guarantee your announcement will get picked up by any media outlets, but don’t let this discourage you. Thanks to the flexible nature of content, you always have a chance to reach your audience. Even if your first release doesn’t seem to get you anywhere, keep up with your schedule. Write new releases for all newsworthy announcements, and continue sending them out to relevant channels. The more you write, the better your releases will become. Over time, you’ll cultivate relationships with journalists, bloggers and industry leaders, and they’ll start taking notice of your press releases. Their influence and your efforts to highlight announcements with a solid SEO and social media strategy will increase visibility and begin to pay off with new customers, more sales and a stronger public brand presence.